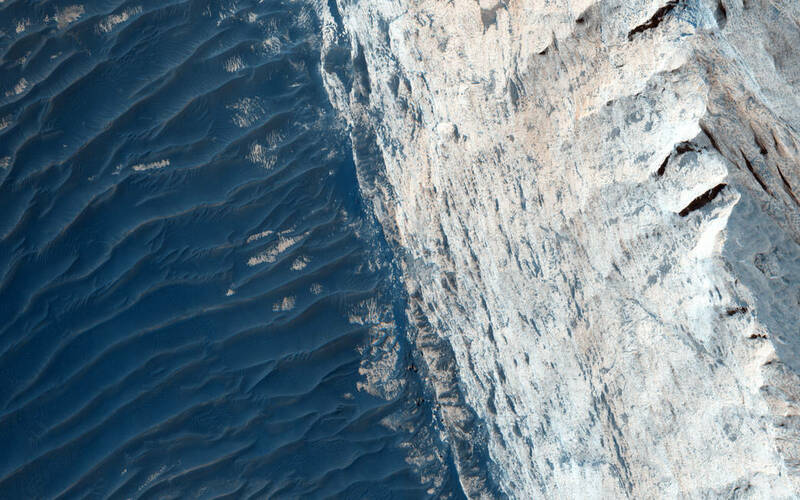 November 9, 2015 – Ophir Chasma forms the northern portion of the vast Mars canyon system Valles Marineris, and this image, acquired on August 10, 2015, by the High Resolution Imaging Science Experiment (HiRISE) camera on NASA’s Mars Reconnaissance Orbiter, features a small part of its wall and floor. The wall rock shows many sedimentary layers and the floor is covered with wind-blown ridges, which are intermediate in size between sand ripples and sand dunes. Rocks protruding on the floor could be volcanic intrusions of once-molten magma that pushed aside the surrounding sedimentary layers and “froze” in place.